Well hello November! 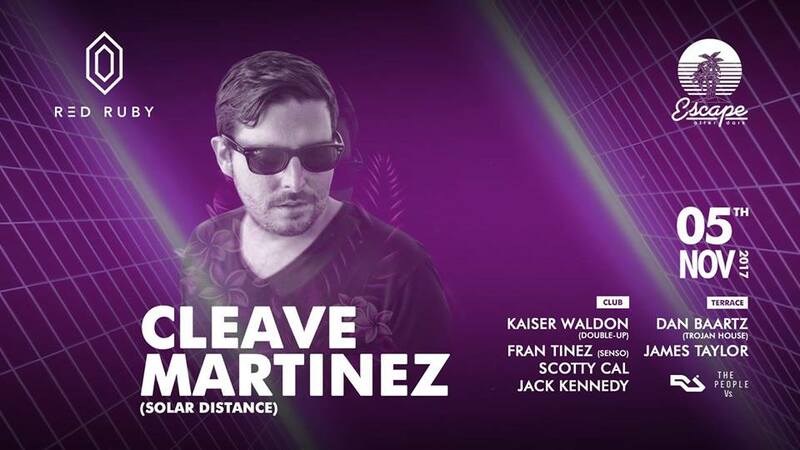 Shaking off a week long celebration of Halloween shenangigans we are happy to announce this Sunday we keep this islands magic circulating on Red Ruby's dancefloor as we Escape to the sounds of Cleave Martinez (Solar Distance). Originally from Barcelona, he combined his passion about music with dedication to create a signature sound, where hypnotic characters and organic rhythms represent his very unique style. Be part of the frequency, click on ATTEND/GOING and we will put your name on the guest list for this event. Strict door policy: Minimum age 18. Kindly note management reserves the right to refuse entry.